People often face a lot of challenges while choosing a career. Many of them opt for a career in a specific field in order to earn a higher salary than what they are currently earning. A recent study revealed that people tend to change jobs when there is a chance to receive a pay hike. But when you are looking for a new job, money is not the only factor which should have more priority. Otherwise, after a point, you may lose interest in your profession which may have an adverse impact on your work. Passion is an important factor which you cannot afford to ignore. The success of a professional in a chosen field depends on his passion and dedication. Experts are of the view that, people who have a deep interest in a specific field are likely to thrive in it rather than those who opt for it only to have a higher income. Having a passion is therefore essential, for the long-term success in a chosen field. For example, if you have an interest in financial planning, then you should go for it. Do not choose a career in a field in which you have no interest. Your skill sets may prove to be useful across a wide range of industries and jobs. Once you have opted for a career, you need to focus on the work culture in a company and the people who work in it. Try to find out how the staff of the company is rewarded and promoted. Though the job or company may be suitable for you, the work culture within some organizations may not match your priorities. One of the most effective ways to acquire this information is to get in touch with people who are currently working with the company or have worked there in the past. It will help you to acquire a firm idea about the type of work environment that an organization has before you join it. The type of people with whom you will be working also needs to be taken into consideration. This is because you can only perform to your true potential if you have cooperative colleagues. The time which you spend in research can help you choose a correct career path. But nothing can teach you better than experience. A short-term internship, temporary job or job shadowing will provide you with a considerable amount of experience. This will help you in a great way to choose a career. If you don’t like the work culture of the company, then it would be better to find out the truth soon. Don’t overlook this point altogether. The experience which you have gained may not be typical. Consult trusted friends or advisors for their suggestion. This will help you to make a good assessment of the situation before rejecting some of the options which are open to you. You must have a deep passion for the industry where you would like to make a career. This will help you have the determination to face stormy situations. A deep interest also creates an innate desire to learn new things and work harder. Shoving and going above and beyond are vital elements in a person’s success in a particular field. This is the view of some HR experts. Nothing can be gained too easily. Yet it is easier to work on a project you have interest in. Therefore, maintaining your focus on the latest developments taking place in the industry you are involved in, is essential. Companies try to create a positive impression on candidates by showing fake records of their success. You should not get carried away by these. Instead, you need to spend some time researching on the recent success of the company and their hiring trends. Has the company been operating steadily despite the problems in the global economy? If it is indeed doing so, then you are likely to have a quite stable job. In case it is not, then you will need to take a decision carefully. You might be joining an organization which lacks a good work environment. You may aspire to see yourself in a higher management position in the long run. You may wish to advance beyond a job at the entry level or pursue a different career path within your own profession. You never know where life can take you to. But it is always wise to choose a career which will have long-term growth prospects. Therefore, consider the job placement rates in the subject in which you wish to master. Also, try to find out what the alumni are doing after completing their specialization in that specific field. Apart from passion, you should also consider your growth prospects in that field before starting your career. Most careers have specific conditions which are associated with them. For example, most people engaged in the real estate sector work outdoors. All lawyers have to spend a considerable amount of their time in getting acquainted with the new laws that are being incorporated. Most miners have to work in inhospitable working conditions all day long. Therefore, you need to find out the conditions like the level of work pressure, hours of work, amount of travel, the level of responsibility etc. Make sure that you will be able to handle the work conditions in the specific industry. Before you start your career in a specific field, you need to consider the possibility of getting suitable jobs in that field. In industries that are not growing, new people are hired to replace employees who have changed their jobs or have retired. However, in industries that are growing, additional workers are needed to satisfy the expansionary needs of the organizations. The introduction of new products and technologies has a significant impact on the employment opportunities. Government investments and economic conditions also alter the job opportunities in a specific industry. You need to take all these factors into consideration while choosing your career in a specific field. Some occupations such as logistics and real estate are far more physically taxing compared to others such as IT. Jobs that require people to carry heavy objects must possess a considerable amount of physical strength. There are certain occupations that make it necessary for people to perform repetitive tasks. These are professions where workers have to stand for long hours. A simple example is the hospitality industry. Other professions may require workers to have a good vision. 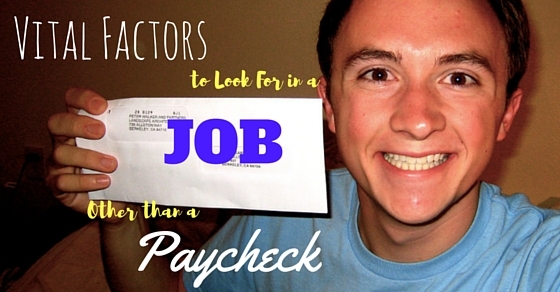 Therefore, when you start looking for a job, you need to keep in mind the physical demands of the job. Your choice or job preference should be based on these facts. Before you select a particular profession, it is always necessary to find out whether you have an interest in the type of work. Start by focusing on the things which you do well. Then compare them with the tasks which you will be handling as a part of your job. Seek the help of a career counselor if you have trouble in deciding on the exact career which you would like to take up. You may be surprised to find out that some of your hobbies also can help you to choose a career. At the outset of their career, most people have to work hard at a lower pay. But the most important thing that you should consider is whether a career in a specific will help you grow as per your ambition. Some important factors which you need to consider are the amount of time you will need to devote, the salary you receive and level of job satisfaction. Therefore, before choosing a particular profession, be sure whether it will help you have the lifestyle. You can never be sure of any industry. People who learn and stick to an industry and stay in the same for a long period stand a very big risk. If the industry experiences a slack period, the person will not earn and may not be capable of any other career. Diversified knowledge helps you select different career options. This way you will never run out of a job. Go for knowledge and not the paycheck if you wish to work all life and earn well.